Yeah! I can finally get BOTOX! Wait a minute! Isn't that stuff a terrible toxin or something??? They sure had me fooled for a minute with the ads on TV for "Botox Cosmetics". Soft, soothing music, smiling faces......kind of like an Ivory Snow commercial, isn't it? NO WRINKLES! What they aren't saying is PARALYZED MUSCLES IN YOUR FACE! I guess it's no more ridiculous than an ad for a purple pill (don't bother to ask what it's for, just tell your doctor you WANT it!) or that other animated pill that is "so cute that you want to take it home as a pet!". But, even more impressive than the Botox and pills? The THONG SANITARY PADS!!! I can finally wear a thong and now I don't NEED one! That's depressing, isn't it? Hey, don't let it get you down! Just take one of those purple pills to get your mood back up, go in for a botox treatment so you can't frown even if the purple pill doesn't work, and then wear one of the new sanitary pads even if you don't need one. At least you won't be lying when you whisper in someone's ear, "I'm happier than I've ever been AND I'm wearing a thong!" Honestly, if you feel that plastic surgery (actually, cosmetic surgery) will help you get through the aging process, by all means, GO FOR IT! There's not many of us who, if money was no object, would refuse to consider a few tiny procedures for those problem areas we all have. I just want you to be totally educated when you make the decision to "go under the knife" or the injections. Just like there was so much misinformation about menopause and hormone replacement therapy based on a pharmaceutical company's marketing, this could also be the case with something like botox. It's been approved by the FDA for cosmetic purposes and the ads on tv are far removed from any medical reference or purpose unless you want to consider a "Botox Party" as medicine for the soul. The marketers of all these products and procedures target our egos and play up the "stay young forever" dream, just like they did with estrogen. A recent press release from the American Society of Plastic Surgeons states: Say Goodbye to Prescription Pain Relievers: ASPS Study Reveals Surgical Treatment Dramatically Decreases and Even Eliminates Migraine Headaches. I truly hope this is a valid discovery that will help the thousands of women who suffer with migraines. From the ASPS site: Choosing to have plastic surgery is an important decision, and so is selecting a plastic surgeon. Whether you're considering cosmetic surgery to improve your appearance or reconstructive surgery to correct defects or improve function, you want a board-certified surgeon with the skill and training to help achieve your goals. The American Society of Plastic Surgeons (ASPS), established in 1931, is the largest plastic surgery specialty organization in the world, and is here to guide you through this process. 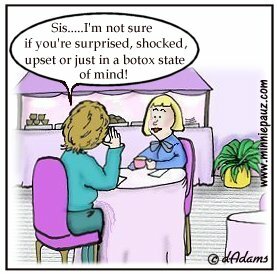 Now there's even an alternative to Botox. It's a cream called Serutox and the claims are that it works by relaxing the muscles rather than paralyzing the muscles the way BOTOX does. No needles, supposedly lasts longer and costs around $300 LESS than Botox.